Just recently, I attended a lesson on hand quilting. There were six of us and we sat around working on our stitching and had a lovely little chat about many things. It was so nice and casual and relaxed, as any get together should be. Here is a picture of my piece of hand quilting including the basting stitches that are weaved through the piece in purple. I didn't get very far and have not sat down with it since. I'm amazed at what an art form hand-quilting is. 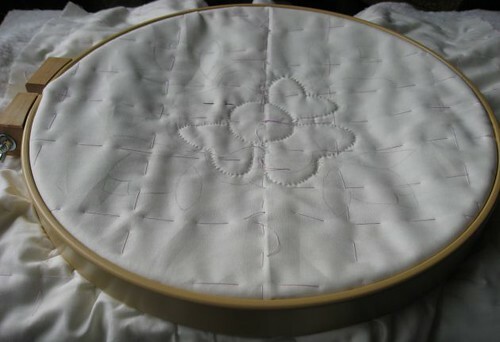 You have to move the tiniest little needle in a special rocking motion in order to get through the batting and to create the smallest stitches possible. You have to get used to using a thimble or you will wreck your fingers. All, in all, a lovely day out! You have been busy Juni! The quilting looks gorgeous - not something I have tried eyt - maybe one day. I love the colour of the beanie you are knitting, the wool looks so soft and warm. We'll make a quliter of you yet!